To check your main account balance, enter *101# and press the call button. To check your Tourist PREPAID SIM balance, type *100*2*2# and press the call button. By calling *100# you can check your main account balance, Tourist PREPAID SIM balance, and you can also activate haloo options for mobile Internet. The haloo Tourist PREPAID package is valid for 15 days after activation. The package will be renewed automatically if your account balance is sufficient (20 BAM) at the time of expiry, otherwise it will be deactivated. You can manually renew the haloo Tourist package at any time by dialing *100*2#. 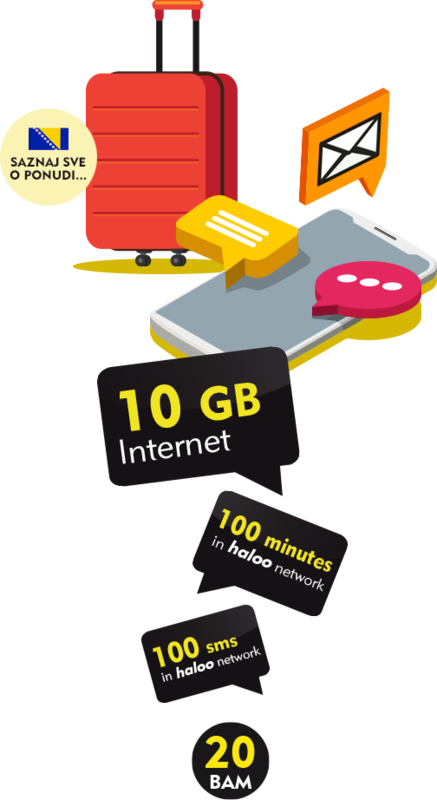 If you don’t wish to extend the haloo Tourist PREPAID SIM or if you use all your Internet data before the expiry of haloo Tourist PREPAID SIM, you can activate one haloo options for mobile Internet. To activate the options, it is necessary to have enough credit for activation on your main account. In order to access mobile Internet, mobile data on your mobile device need to be turned on. If you cannot connect to the Internet, restart your mobile device. If you still cannot connect, check the access point name (APN) in the mobile device settings, and if necessary type it in. All prices are listed in BAM, inclusive of VAT. All calls are charged per unit and one unit is 60 seconds. Mobile Internet is charged in 10 kB units. You can recharge your main account at any better store in all cities of Bosnia and Herzegovina. Uslovi korištenja haloo TOURIST PREPAID SIM.